In the far corner of the North One Garden Centre, De Beauvoir Town, Paul Holt is busying around this month’s luscious indoor arrangement. A large and exotic Phoenix roebelenii takes centre stage. It’s giant palm-style leaves burst outwards and upwards like a firework mid-display. Wooden shelving is dotted with black and white woven pots and rustic string macramé plant hangers dangle elegantly from the ceiling. The backdrop is even more pots, with burnt orange and turquoise ceramic glazes, and a tempting selection of bushy green Rhipsalis, wiggly Epiphyllum and a striking African spear Sansevieria. We’re discussing the North One and West Six exhibit at this year’s Grow London, the contemporary garden and lifestyle fair held in West London’s leafy Hampstead Heath. ‘The best thing about Grow is it’s attention to younger people who might not have their own gardens, or be that familiar with growing plants,’ Paul explains. ‘It’s different from the established Chelsea Flower Show and Hampton Court Flower Show, both organised by the RHS,’ he adds. ‘Grow London is aimed at a slightly different clientele, some of whom are going into gardening for the very first time.’ Grow London is still new on the scene, launching in 2014 and the North One and West Six Garden Centre has grasped the opportunity to exhibit for the past two years running. 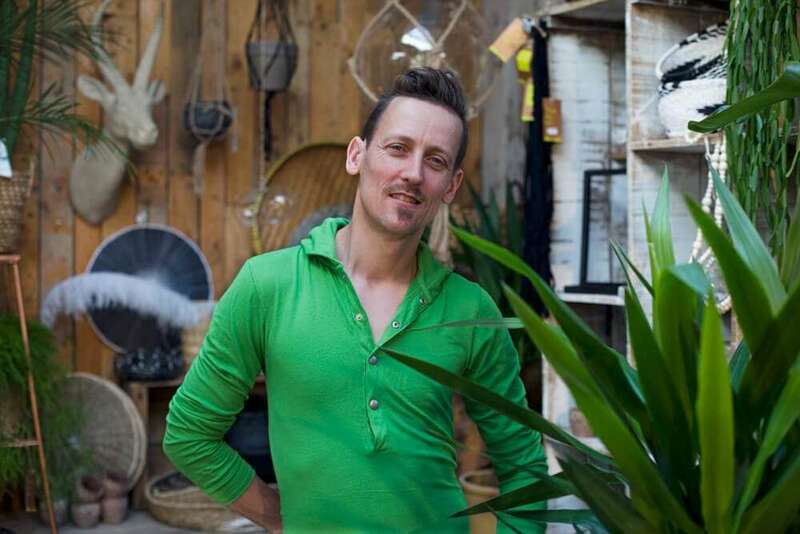 ‘Last year was a success,’ says Paul, their Creative Director of six years who’s role is to oversee the image of the business, as well as doing the buying and merchandising of house plants, decorative accessories, pots and furniture. ‘The stand was about three quarter house plants and a quarter outdoor plants, but it was the house plants which got the most attention, so this year we decided to put more effort into that,’ he explains. ‘I started thinking about ideas for this year’s stand last July and the product that started it off for me was this…’ Paul reaches over to one of the displays and plucks out a small indoor ceramic terracotta pot. It’s colour is white-grey and black and the pattern is distinctively tribal. Diamond within diamond shapes jump boldly off the surface. ‘I really liked these pots, so I thought, lets start doing something African,’ he says. With Paul’s imagination set alight, from there he started to build up a bigger picture. The finished stand was filled to the brim with a striking assortment of tribal pots and decorations, beautiful woven baskets and furniture and attention grabbing giant house plants. The largest being an unmissable 11 foot Veitchia merrillii or Manila Palm. On the opposite end of the scale, there were lots of miniature plants, including terrarium plants, small cacti, air plants and a sea of colourful succulents arranged on a vintage street venders cart. ‘So people can create their own mini gardens, if they don’t have so much space,’ Paul explains. Battling rainstorms and referendums, the visitors arrived as planned and the fair was a success. ‘On Saturday it really kicked in and on Sunday we were mobbed!’ Paul recalls. ‘The staff were constantly serving customers and answering questions. We got a lot of attention from not only the visitors, but the other exhibitors there as well, and the organisers of Grow themselves. I think it’s really important to have a standard within this industry,’ Paul says. ‘The feedback after the show from customers coming into the store has been excellent as well.’ The press also picked up on Paul’s exhibit and the garden centre was featured in the Ham&High, Evening Standard and on BBC London radio. When Paul arrived at the N1 Garden Centre, 13 years ago this month, he saw lots of outdoor plants, but only one table of indoor plants and just a few pots. ‘I thought, this is a good opportunity to try and create something here,’ he recalls. ‘Over the years we’ve just built up and built up and the momentum keeps going year on year.’ I ask Paul if he’ll be exhibiting next year. ‘I think the answer to that is yes!’ he responds. Everything displayed at this year’s stand including the African tribal collection, is currently on display at both the N1 and W6 garden centre’s. So if you missed the fair, why not pop down to the garden centre to have a browse for yourself. I can’t wait for next year’s Grow London, and to see what Paul and the N1W6 team create next. To find out more about Grow London, visit growlondon.com, and to receive the latest news and tips from the garden centre, be sure to sign up to our newsletter (in the news & tips section of the website), and follow us on social media.